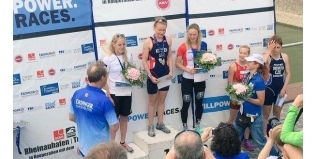 Saturday's ETU Aquathlon European Championships in Cologne, Germany had a distinctly 'British' feel about it, given the Team GB dominance in terms of entries and medallists. The overall Elite title went to Hannah Kitchen, who dominated proceedings, leading out the swim by a clear 25 seconds and then adding the third fastest run split which brought her home with a winning margin of 24 seconds. In this event last year Hannah won the Silver medal and then went on to add a Bronze medal at the World Aquathlon Championships in Edmonton. In the Elite men's race, Sam Wade (who was out ERDINGER Athlete of the Month for May), finished eighth (30:45), with Neil Eddy 14th (31:48) and Michael Lewis 15th (31:51). The Men's Elite winner was Tomas Svoboda (CZE) in 29:30. That finish from Lewis was also enough for him to earn Silver in the Junior Elite category.